✔️ Yes, Crista. I want to join your advisory for a low introductory rate and start profiting from the market's best undiscovered stocks. • Access to our 24-hour private website, to view your subscription and the library of the archives of the latest content and issues. • My contact information to email me with questions anytime. 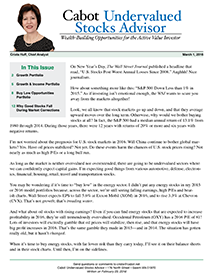 • Free subscription to our Wall Street’s Best Daily e-letter. • Plus a full 30-day money-back guarantee. If you’re not 100% satisfied, you can cancel your subscription, absolutely no questions asked, and get a full refund within the first 30 days. If you decide to join us on a monthly basis, just advise us when to terminate your membership and we’ll cancel it before the next monthly charge.